David Tregunna, Director, IAP Fine Art, on Gollon’s diptych: “As you may know, the Romans used the mastiff in conquests from 100 years BC and Julius Caesar acknowledged the breed for its courage in battle. The mastiff certainly helped the Romans conquer our own little island too; but over centuries we then developed the breed and used it in battle against the French at Agincourt to very successful effect. The French used another ancient breed, the very majestic and most aristocratic of hounds, the Bleu de Gascogne, said to be the forefather of most hounds. They were brought in to protect the French knights, if fallen from their steeds; but they were no match for the English mastiff, despite being of similar size. Indeed, the body of Sir Piers Legh was guarded very successfully (and famously) from looting by his mastiff on the field of the Battle of Agincourt. 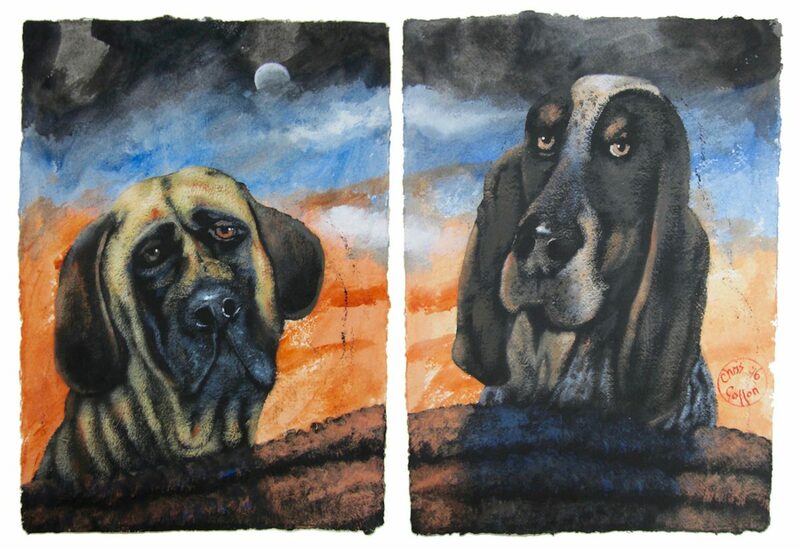 In Chris Gollon’s diptych, the English mastiff is to the left and the Bleu de Gascogne to the right.